With the first six months of the year behind me it’s time for the half-yearly portfolio review. As is visible in the table below the first half of 2013 was excellent. I knew my return was good, but I didn’t realize it was this high before doing the math (I’m using multiple brokers, so keeping track of performance takes some work). As discussed here I decided a month ago to increase my bet on Conduril simply because I think the stock is extremely cheap, and I want to bet relative big on my best idea. Since then I bought a few more shares and with the stock price also advancing 10% my current allocation stands at 16.5%. I expect it to grow to become an even bigger part of my portfolio, because if this is my most attractive idea it should outperform the other positions. While I don’t trade a whole lot in my existing position there has been some movement in my allocations that is not completely the result of the relative performance of the various stocks. I reduced my position in Allan International, and I’ll probably sell the remainder of my position soon. The stock has been a top candidate to sell for me since last December when I reviewed the position, and my net long exposure is currently a bit above my target of 100%. While I reduced my Allan International position I increased my Deswell Industries position a bit. A lot of the return from Deswell Industries is coming in the form of dividends, so even though it’s performing alright the allocation as a percentage of my portfolio was dropping. I also sold some Alternative Asset Opportunities opportunistically some time ago. The amount of cash collected from the life insurance policies has been very low so far this year while the stock price has been going up since I initiated my position. That said: I do think it’s currently still attractive because how fundamentally uncorrelated the returns are with the general market, and I’am looking to increase my position again when possible. As is visible Asta Funding (ASFI) has been my worst performing position this year so far, but when your biggest loser is down less than 10 percent you can’t complain. The company has been written up very recently by Whopper Investments on Seeking Alpha, and he provides a refreshed overview of the investment thesis. I think intrinsic value is slowly going up because the company is collecting the outstanding receivables and buying back shares, but it would be nice if they could speed up the latter using, for example, a self tender offer. I’am hoping that at the end of the year, when it’s time for the next portfolio review, my biggest complaint is still this insignificant :). I certainly don’t expect to repeat the performance of the first six months though: that’s more luck than skill. This entry was posted in Portfolio on July 1, 2013 by Alpha Vulture. Congratulations on a great H1. Can I ask a question about Berkshire? It’s currently trading on, what, 1.4* book, and they’ve always benchmarked themselves as growth in book value vs growth in S+P500. They’ve said they will only be able to beat S+P by a few percentage points going forward. Let’s say S+P growth (inc dividends) is 7% (and that’s generous) over the long term, that puts Berkshire on 10% (again, generous). If you are buying at 1.4* book., I don’t think you’re giving yourself much space for outstanding returns. You clearly know what you are doing, why invest in a “tracker deluxe” like Berkshire (when it’s 1.4 * book)? Are there not better opportunities out there? I agree that they won’t be able to beat the S&P by a wide margin, but just beating it is nothing to sneeze at. And I don’t think it’s clear that I know what I’am doing. Results so far are encouraging, but the sample size is very limited. If I’am indeed able to outperform Berkshire the allocation as a percentage of my portfolio would drop automatically. I also like my position in Berkshire because it’s a different kind of asset than a lot of the other companies in my portfolio, most of my other positions are lower quality businesses. So it also offers some diversification benefits. 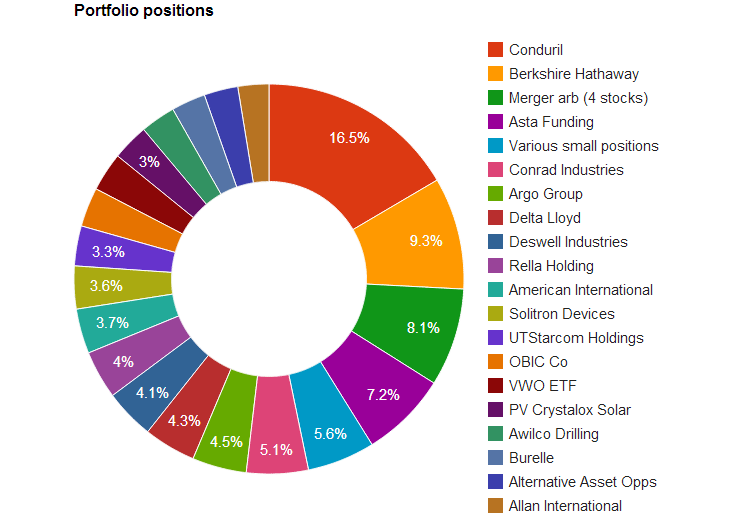 You see that I also have a small position in the VWO ETF, a tracker pure-sang, also motivated by diversification. And I have to admit that part of the reason of owning Berkshire is not completely rational: I also own it simply because Buffett is my hero. …when are you starting a fund? Impressive returns! What software do you use to track your portfolio performance? I am interested in doing something along the lines of this post as well. I simply use Google Drive. With the GoogleFinance functions that are available you can easily get current and historical stock prices and exchange rates. But it takes some manual work too to get the above numbers. Impressive :). Small question: for Conduril I see an entry price of 22 EUR, but I think you have been averaging up since you bought some more the last couple of weeks. I assume you took this into account for calculating your performance? And even though I also have a large position in Berkshire I think Tom has a point. If you do know what you are doing BRK is probably underperforming your portfolio. If you don’t know what you are doing the position is too small to save you anyway 🙂 I agree that he’s a hero but if he was at your point in his career he probably wouldn’t own berkshire. Maybe you can honor him better by investing in his ‘style’ rather than in his company. Great job – I’ll update my performance some time this week. Spoiler: it’s not as good as yours. I sold my cnrd (albeit too early) back in January. You don’t think it’s played out at these levels? I think this can and should go higher. Backlog is at record levels, they are again building up cash after the payment of the special dividend while investing for growth and they should receive a sizable settlement from BP this year. I hope the last part of 2013 treats your portfolio well! What brokers do you use for trading international equities? And what type of commissions are they charging for these trades, outside of North America? I use IB for most of my international equities, including the US. Their fee is something in the $5 range for non-US equities. I also use Binck and Saxo to get access to some of the smaller markets in Europe, they usually charge a higher fee: around $10 or $15 or so.